Who doesn't love an extra long weekend? The Greyhound Inn are offering a 'Lazy Winter Sundays Break' where you can enjoy a delicious three-course Sunday lunch, a two-course supper and overnight accommodation in one of their tastefully decorated bedrooms. Stays include a complimentary welcome drink and full breakfast the next day; it's the perfect way to start the week. The great offer is valid until 31 March. Tucked away in a little-known South Suffolk village, close to the honeypot towns of Lavenham and Long Melford and just a stone’s throw from the delights of Constable Country, this elegant country house B&B is about as homely a place to stay as you could wish for. And until 17 March, stay a night for just £99. Even better, the deal includes their four-poster rooms and suites. This collection of three properties in Cornwall includes one luxe cottage and barn accommodating parties in excess of twenty-two people, Barford Beach House with its six bedrooms sleeping up to sixteen guests and Pentire Penthouse housing up to ten. Each is individual, stylish and luxe, and there's 20% off last minute bookings for a holiday taken before the end of March. 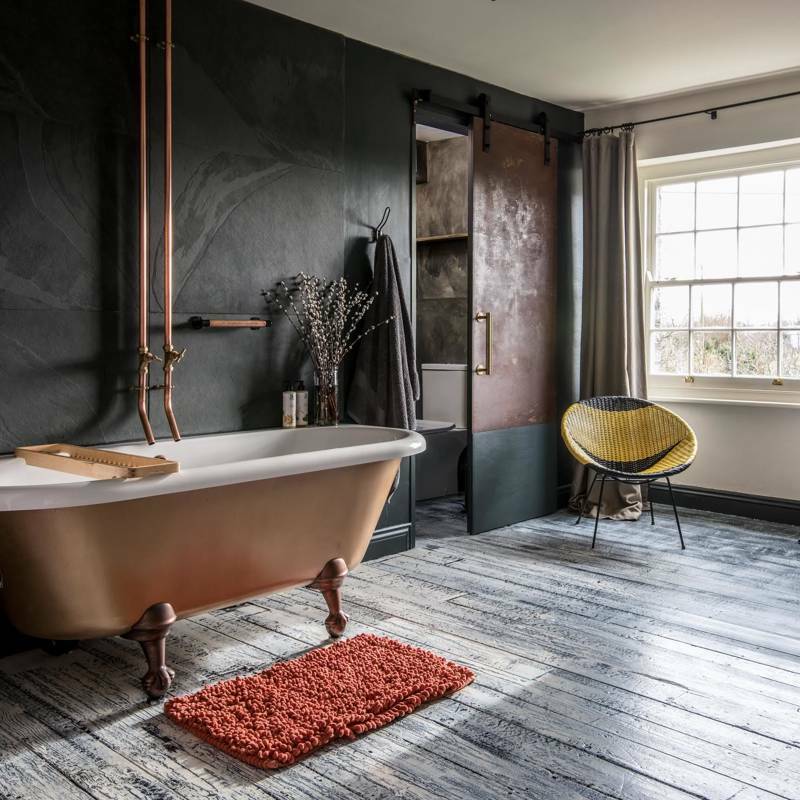 Old and new fuse seamlessly in this chic self-catering cottage nestled in the glorious Somerset Levels. It’s the kind of place where you walk from room to room thinking you'd like to take every piece of furniture home with you. This February and March they're offering 10% off all bookings – what are you waiting for? Charming, historic and perched right on the edge of Falmouth harbour, this spot has a fab restaurant and uninterrupted panoramic views. Join them for their special 'Winter Getaway', with prices from just £99 per room, including a delicious breakfast and an added treat of a mini Cornish Cream Tea in the Water's Edge bar or two drinks in the Working Boat pub. This is the perfect contemporary seaside B&B with a view over the beautiful Pembrokeshire coast. Along with the inspiring vista Manor Town House has six lovely guest rooms, each decorated with flair. They're offering three nights for the price of two or 50% off a second night (two night stays) – valid until the end of March. Quote CP100 when booking. Escape to the Shropshire Hills and enjoy your own country estate with our friends at Walcot Hill this winter. They're offering 15% off all breaks until 31 March – and can accommodate families, romantic couples or large groups. Be quick and book now. Plus, there are glamping options too: save 10% on all bookings before 30 April. These guys do wonderful holiday cabins in the woods all over the UK, and Forest of Dean is a glorious stretch of ancient oak woodland, spreading out from the Wye Valley. Enter COOLPLACES to save 5% when booking. Head out onto the water on a small-ship Hebridean cruise and take in the wildlife and scenery of this amazing part of Scotland. At the moment, they're offering a 20% discount for families with a booking of over four people. Quote CP2019 when booking. A wonderful waterside restaurant and bar with a set of comfy boutique rooms upstairs, The Boathouse is offering three nights for the price of two until 28 February. Situated in a tranquil location in the heart of the Broads National Park, it's the perfect place to escape to for a few days. Are you looking for a half-term getaway for the family? Why not visit South Devon and stay at Thurlestone Hotel, where under twelves go free when sharing a room with two adults. They also have a children's activity programme to ensure the littles will be entertained during your stay, and the hotel's facilities include a pool, gym, hot tub and much more. We're big fans of the Felin Fach Griffin – it has seven very comfortable rooms above a restaurant that is one of the best in the region, and this winter they're offering one-night Dinner, Bed & Breakfast stays for just £170 for two. There are also savings on longer breaks if you fancy extending your stay in the Welsh countryside that bit longer. Plus, they have wonderful sister properties in Cornwall: the Gurnard's Head near Zennor and Old Coastguard in Mousehole. This is Truro's best hotel – a grand old building with some very cool, modern rooms. Stay for one night bed and breakfast with a delicious cream tea included for just £99. Whilst there, enjoy crisp beach strolls, fantastic food, tasty tipples and garden views - what more could you ask for? The New Forest is particularly beautiful at this time of the year so why not book a stay at Careys Manor? Until the end of March, prices for luxury overnight accommodation start at £189 per person, saving a fabulous £100 a night. And remember, they have a younger sibling too: the Montagu Arms set right in Beaulieu Village is a lovely retreat, and is also offering winter deals. A brilliantly updated country pub, the Fox at Willian has the ideal way to start the weekend... enjoy dinner, bed and breakfast for two on Friday nights and pay just £120 per room. If that's not a bargain we don't know what is – but be quick, it's only available until 15 February. It may be winter but that doesn't mean you can't go glamping, and our good friends at Wheems Organic Farm in beautiful Orkney are offering stays in one of their cosy pods for just £25 a night. Or stay a little longer: a six-night break is just £125. Tempted? This super-stylish place in Newquay takes the concept of luxury beachfront hotel to a new level. Book for three nights and eat in a trio of restaurants in the area; stays (Sunday to Wednesday) include dinner each night – Jamie Oliver’s Fifteen Cornwall, Zacry’s and The Beach Hut – and prices are from £327 per person. Don't forget they have a sister hotel in Cumbria: Another Place, The Lake is a worthy option. Why not visit Cornwall this winter and stay at this quirky hideaway with two terrific restaurants and a location to die for on the Polperro Heritage Coast. Be part of their 'Winter Escape', which includes two dining options and starts at just £190 per room per night. This Art Deco building in North Devon is simply fantastic and retains many of its original features, and the vibe of the hotel is chilled and family-friendly. How about indulging in a spa break? Book one, two or three nights of pure relaxation in one of the most beautiful pockets of the world. Stays include a top-notch breakfast, full use of the leisure facilities and a 30 minute treatment. Prices for 1-night start from £160 per person. Twisting and turning along the winding country lanes, surrounded by undulating green and yellow fields deep in the heart of the Welsh/English borders countryside, it's almost impossible not to get childishly giddy about what treats await you at Cosy Under Canvas. And prices are from £160 for a two-night stay in low season; get toasty in one of their domes, each with its own wood fired hot tub.